The response to my post last month on bookshelves, curios and built-ins with painted interiors was pretty overwhelming. It seems that there are many, many people out there who are as obsessed with the look as I am. So much so, in fact, that I thought I'd pull together a second set of images celebrating even more colorful backdrops. Above, the bright orange shelves bring a jolt of fun color into an otherwise all white and gray space. 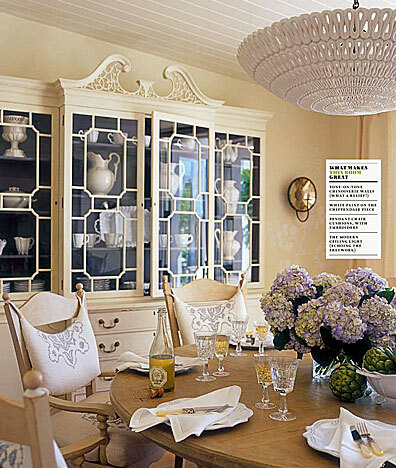 It's also a wonderful contrast to the simple, white vases and the white magazine racks. An orange task light brings in a second pop of the same color and the repetition of the hue outside the shelving helps bring balance the composition. This pale blue gray makes my heart sing, especially against the soft off-white trim and dark ebony floors. It's the perfect, subtle statement and beautifully highlights all of the ivory and ecru pottery. A subtle greige background to these built-ins adds dimension to the walls and helps highlight the owner's large collection of white porcelain. Note too how well balanced the arrangements are within the shelves themselves. 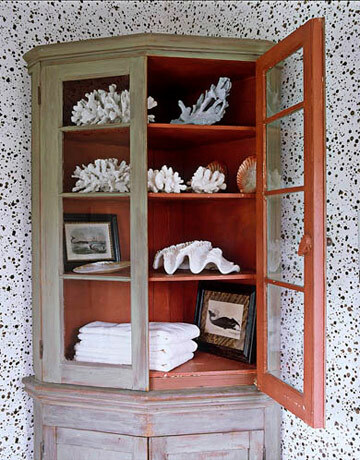 I love how nicely this coral interior sets off the sun bleached coral. You can bet this subtle play on words was intentional. One of my all-time favorite dens. I love the oversized striped ottoman, mosaic tile around the fireplace, neatly tailored chairs in a variety of fabrics (love the squiggly pattern on the chair nearest the fireplace in particular). All in all, it's lovely. What's interesting too is that on first glance, blue appears to be the dominant color; however, when you look closer you realize that the only blue element in the entire space is the backs of the built-ins around the fireplace -- the rest of the space is entirely decorated in neutrals. The beauty of this is that a simple change of paint color in the built-ins would switch up the look of the room completely, without the need for changing any of the furnishings or other accessories. Of course you needn't limit yourself to paint when it comes to kitting out your shelving. Wallpaper works just as wonderfully and, since you aren't covering a large surface area, can be just as economical. It's also a wonderful way to experiment with wallpaper without the commitment of having it on your walls. 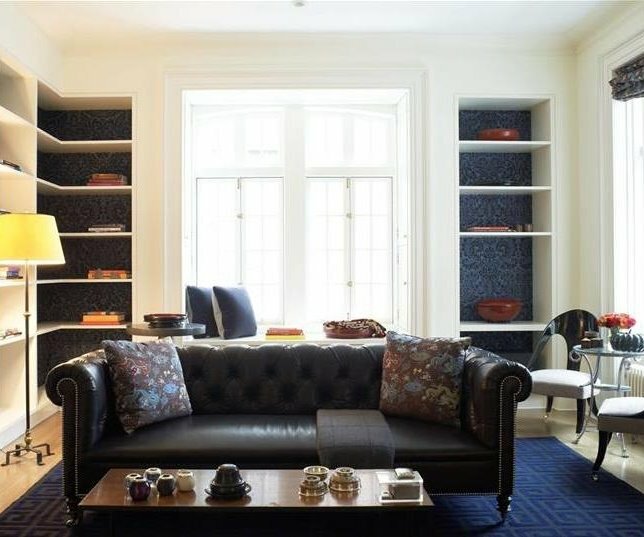 Here, the lovely tone-on-tone navy damask brings in another pattern into this sitting room without overwhelming the space and disturbing it's minimal, clean aesthetic. 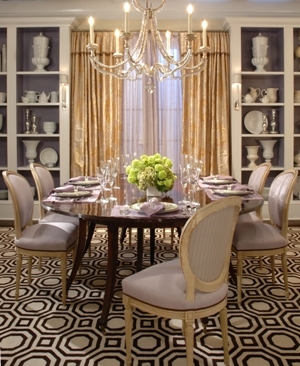 The traditional, ornate damask is also a nice, quiet contrast to the greek key patterned rug. 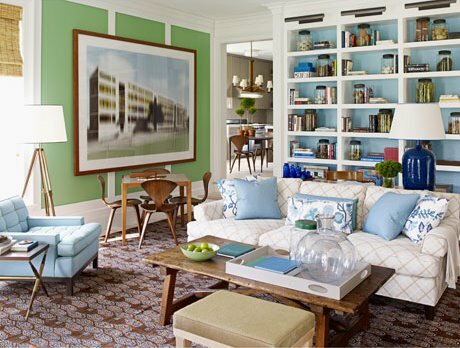 More blue here in this living room from Steven Gambrel. I love how the bright blue ties in with throw pillows and side chair and it's a wonderful contrast to the grassy green walls and crisp white trim work. This room is actually from the Serena & Lily catalogue, but it's still one of the best designed bedrooms I've seen in a while. Of course, the fun pink walls behind the built-ins and all the Jonathan Adler pottery are right up my alley. 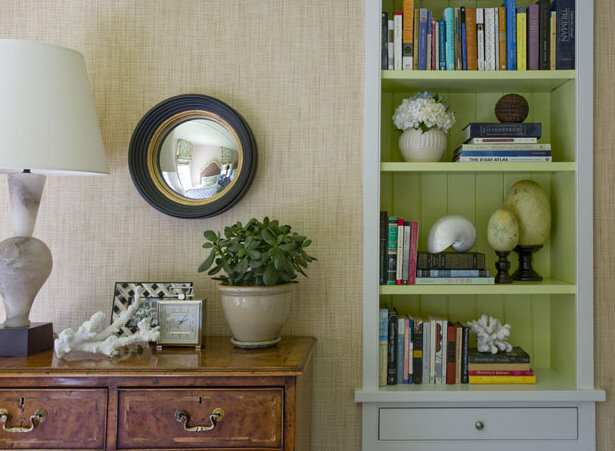 This is a great example of how you can use this technique to bring in a color used elsewhere in a room or in your home (the soft lime green inside this small bookshelf brings the pale green accent color used throughout this beach house into a spare bedroom). By using the same colors (in different proportions!) throughout your house, you can easily create a cohesive, well designed look. I also love how quiet and almost neutral the color looks against the warm neutral tones and rich texture of the grass cloth wallpaper. I love a dramatic navy blue interior. Such a wonderful backdrop for all-white porcelain serveware. The Oly chandelier is pretty fantastic as well, isn't it? 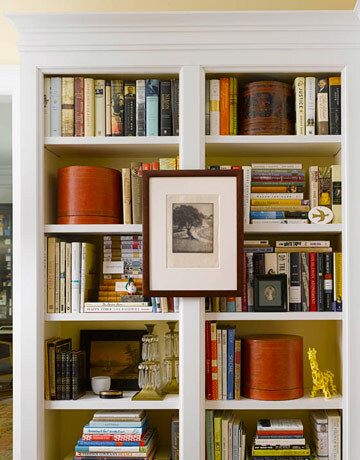 A lovely, soft yellow is a subtle hit of color for these shelves. I particularly like how Elizabeth Mayhew arranged all of her many books and small objects. The effect is full and lived-in without feeling messy or too crowded. It's also nice to see bookshelves stacked full of, well, books. Far too many designers insist on keeping shelves woefully bare and devoid of books in my opinion. And what about you? 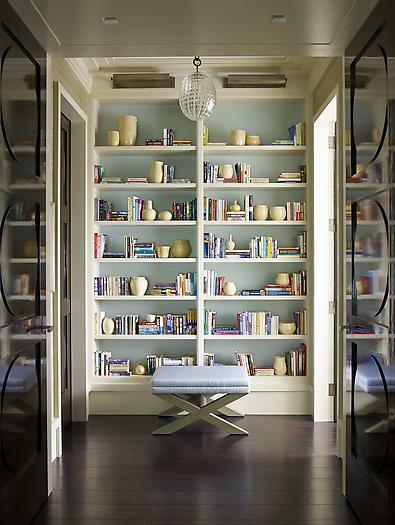 Have you experimented with color on any of your bookshelves, curios or built-ins? If so, I'd love to take a look at what you've done and share it here on Odi et Amo. I wish I was brave enough to do this to my built-ins. Perhaps if I had a spare set or two I'd get more adventurous with them!! All the examples are stunning. Lovely post! You always do such a wonderful job of choosing images for your posts. There are several here that I had never seen before. my bff has the vases from the first shot. loved seeing them on someone else's bookcase! The second and third shot stopped me in my tracks. But they are all gorgeous! I like how one can achieve this with bold looks but also more "moderate" hues. My built in bookcase in the living room has the backs painted in celadon which is a great backdrop for all my design books, blue and white Chinese porcelain, seashells, Herend, Steuben, and other collections. What a gorgeous idea to add a bit of color and depth to some otherwise boring shelves and cabinets! I love the colorful variants, such as the orange and the pink... fabulous idea. Thanks for sharing! Totally gorgeous and inspiring post, darling! I love the frame mounted in front of that fabulous shelf in the last photo ~ what a cool idea! The pale blue-gray w/ cream (love the egg-shaped pendant) and the Tobi Fairley are my faves! I haven't experimented with this kind of painting in our home YET - but I hope to one day. That room with the blue behind the bookshelves was surprising - you're right - I totally did think it was the dominant color until you pointed out that was the ONLY place it was used! Neat trick! I didn't experiment with a bookcase or built-in but I did try some extreme color on my walls and I hated it. I thought a touch of orange with white walls would be great and it is in theory. When I got the bulk head painted and then a small wall it was an utter disaster. I decided in my little house that neutral was a better idea with pops of color. This is so pretty, Averill! 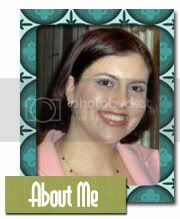 I think the second example is my favorite of all -- so soft and perfectly accessorized with such balance. I believe those are spotlights above -- if so, they are perfect. Love the touches. Sometimes second best is...well, best. Guest Rooms in Blue, Pink...and Yellow!